Here, chefs reveal their favorite ways to upgrade kettle corn. I am obsessed with Aspen Kettle Corn, which is sold fresh at the farmers market on Saturdays. So obsessed, in fact, that I bought the family-sized bag and carried it all day with me so I could spread the love. A few chefs had clever ideas on how to take this crispy, buttery, lightly sweetened treat to new levels. 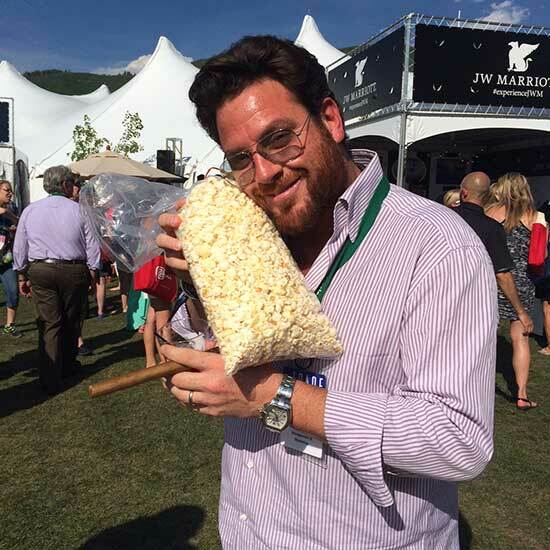 Scott Conant, Scarpetta: I would definitely make a kettle corn-infused panna cotta. Matt Accarrino, SPQR in San Francisco: Crush it and stir it into corn risotto. George Mendes, Lupulo and Aldea, NYC: I'd toss it in a blend of toasted ground pimenton, cinnamon, cumin and coriander. Cara Stadler, Tao Yuan, Maine: Steep it to make kettle corn ice cream. Jonathan Brooks, Milktooth, Indianapolis: Make a homemade Chex Mix with kettle corn and eat it with chicken liver pate! Sang Yoon, Lukshon and Father's Office, LA: Make a foie gras parfait with buttered popcorn caramel and crunchy kettle corn granola. Alvin Cailan, Eggslut, LA: I'd just dehydrate it and use it as a crust for pan-fried fish.